﻿ Williams, D.E. signed typewritten letter to Zora Neale Hurston, Tallahassee. (1p. 8 1/2 x 11). Sympathizes with her about her disappointment in behavior of fellow teachers. Williams, D.E. 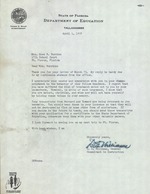 signed typewritten letter to Zora Neale Hurston, Tallahassee. (1p. 8 1/2 x 11). Sympathizes with her about her disappointment in behavior of fellow teachers. to my continuous absence from the office. by holding these things in your memory. Education, otherwise keep them with your other valuable papers. I look forward to seeing you on my next trip to Ft. Pierce.